I’ve had a few friends experience a problem with their Spotlight search results after upgrading to Mac OS X Lion and at other times for other reasons. They claimed to search for items that they knew were somewhere on their computer, but Spotlight wasn’t able to find them in both cases. 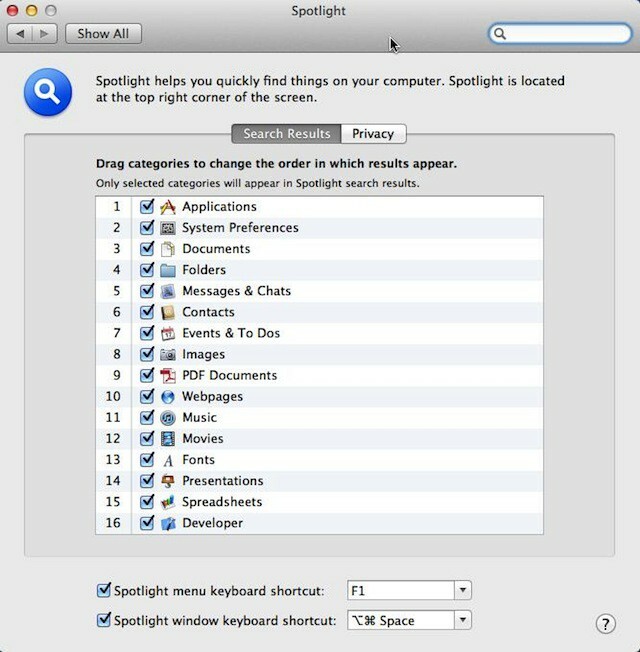 Here’s a down and dirty fix for Spotlight that is useful when Spotlight seems to stop providing the results you expect. It is also useful when you just want Spotlight to re-index your system. Drag your Macintosh HD (startup drive) to the list. Remove Macintosh HD from the list. This will force Spotlight to re-index the contents of Macintosh HD. If you prefer to not do something as drastic as this you can drag a folder and its contents to the list in place of Macintosh HD in the steps above. This will cause Spotlight to re-index only the folder and its contents. Periodically performing an entire disk re-indexing in Spotlight probably isn’t a bad idea either.